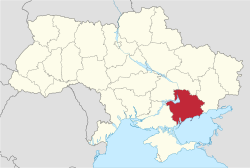 Zaporizhia Oblast (Ukrainian: Запорізька область) is an oblast (province) of southern Ukraine. The administrative centre is Zaporizhia. The population of Zaporizhia Oblast was 1,774,000 in 2014. ↑ "Zaporizhia Oblast". UkraineTrek.com. Retrieved 11 December 2017.